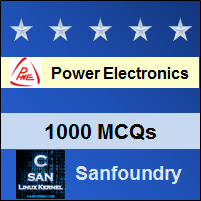 This set of Power Electronics Multiple Choice Questions & Answers (MCQs) focuses on “Types of Power Diodes-1”. 1. 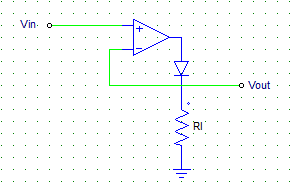 Shown below is the diagram of an ideal super diode. When the input voltage Vin is negative, then the output voltage Vout = ? Explanation: When the input voltage is negative, there would be a negative voltage on the diode so it works like an open circuit. Hence no current flows through the load and Vout is zero. 2. In order to reduce the reverse recovery time of the diodes, __________ is carried out. Explanation: Platinum & gold doping improves the performance of the devices. 3. Which of the following diodes uses a metal-semiconductor junction? Explanation: Schottky diode uses a Al-Semiconductor junction. 4. Which of the below mentioned statements is false regarding Schottky diodes? Explanation: The majority charge carriers in a Schottky diode are electrons not holes. Explanation: Due to the metal-silicon junction there are no stored charges hence, no reverse recovery time, due to which the switching is faster. 6. Which of the following are/is the majority charge carriers in a Schottky diode? Explanation: The metal has no holes hence major(almost full) current flows due to the electrons only. Explanation: Usually only n-type silicon is used because the p-type has certain limitations. Explanation: Due to the metal-silicon junction there are no stored charges, hence no reverse recovery time due to which the switching is faster.